Venous Abnormality or Where Have You Been? For the last six months or so, Christen has been suffering from debilitating headaches that have been accompanied by nausea and dizziness. She’s had migraines since she was twelve or so, and at first we just thought they were getting more prevalent. Possibly that her preventative medication was no longer as effective as it used to be. The headaches started by lasting longer than normal migraines, and her migraine medication didn’t help at all. A several months ago she had one that lasted days and ended us up in the ER.Â Since then we’ve been back to the ER several more times, between doctor appointments and tests. It’s been a really rough few months. First, the doctor thought it might be tension headaches or possibly a sinus issue rather than migraines, since migraines don’t usually last days and there was clearly lots of tension in Christen’s upper back, shoulders, and neck. She sent Christen for an x-ray of her head to look at her sinuses, and when that looked fine she prescribed her a muscle relaxer to try. It didn’t seem to eliminate the headaches, but it did seem to help relieve some of the pain and maybe even shorten the duration. It was far from a fix though. Instead of getting better, the dizziness got worse. Her doctor sent her in for a CT. When the results came back, the doctor called us to let us know that something did show on the scan. 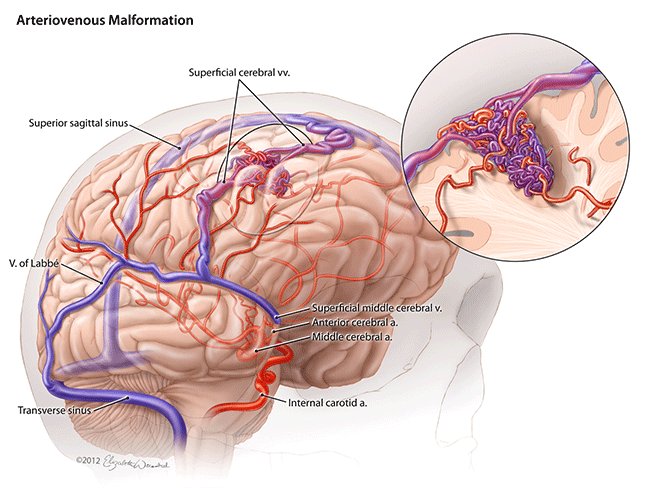 It was around 1cm in size, and while there was no way to know without an MRI, she thought it could possibly be an Arteriovenous Malformation (AVM). Of course, being the person that needs to know everything, I immediately began to research AVMs. Basically, it’s when the arteries, which take blood to areas of your body, are connected to veins that take blood away from those areas and back to the heart. This can cause blood not to flow properly to certain areas, in this case part of the right side of Christen’s brain, and can also cause bleeds, strokes, etc. The solution? Brain surgery. Yep, let that set in for a moment. It certainly took us a while to come to grips with it. The thought of brain surgery is terrifying. Unfortunately, there was really nothing to do but wait. So we waited for the MRI. There was yet another ER visit between the CT and the MRI. They diagnosed her with a severe headache and vertigo, putting a medical term to our complaint of “dizziness”. It was a tough ER visit, mostly because her mental state had deteriorated noticeably. It has gotten harder and harder for her to think and function during these episodes. The doctor in the ER said that her fine motor skills were “troubling” and seemed to be very happy to hear that we were already scheduled for an MRI, encouraging us to follow up with a neurologist no matter what the MRI showed. So now the MRI has happened and we got the results. The vagueness is infuriating and frustrating, but she has a “venous abnormality”. An AVM is a venous abnormality, but there are others as well. So basically, we know there is definitely an issue with the veins on the right side of Christen’s head near her brain, but not much more. We’re working on getting an appointment with a neurologist now. I talked to several today that are booked through July, but I’m not willing to just wait that long. We’re looking at alternatives. So if you’re wondering why I’ve been less active, quieter, slower responding, etc lately. This is probably why (and the issue with my grandma that happened during all this), and unfortunately it’s not over yet. So sorry Aaron. We are praying for you and your family. Looking forward to seeing you all soon. Oh No! Not good, but thank God you found something. I hope it’s 100% fixable and will be keeping you all in prayer. I’m so sorry to just be here and think of Christen there. Just want to give her a gentle hug, so do that for me please. I love her so much and we are all so far apart. I’m not too good at keeping in touch either. Please keep posting if you are up to it. Praying and knowing that Jesus loves her and has his healing hands on her. So sorry to hear all this Aaron. Please let us know if there is anything we can do.